For other uses, see Bathtub (disambiguation). A bathtub, bath, or tub (informal) is a large or small container for holding water in which a person or animal may bathe. Most modern bathtubs are made of thermoformed acrylic, porcelain enameled steel, fiberglass-reinforced polyester, or porcelain enameled cast iron. A bathtub is usually placed in a bathroom either as a stand-alone fixture or in conjunction with a shower. Modern bathtubs have overflow and waste drains and may have taps mounted on them. They are usually built-in, but may be free-standing or sometimes sunken. Until recently, most bathtubs were roughly rectangular in shape, but with the advent of acrylic thermoformed baths, more shapes are becoming available. Bathtubs are commonly white in colour, although many other colours can be found. The process for enamelling cast iron bathtubs was invented by the Scottish-born American David Dunbar Buick. Western style bathtubs in which the bather lies down. These baths are typically shallow and long. Eastern style bathtubs in which the bather sits up. These are known as furo in Japan and are typically short and deep. Documented early plumbing systems for bathing go back as far as around 3300 BC with the discovery of copper water pipes beneath a palace in the Indus Valley Civilization of ancient India; see sanitation of the Indus Valley Civilization. Evidence of the earliest surviving personal sized bath tub was found on the Isle of Crete where a 1.5-metre (5 ft) long pedestal tub was found built from hardened pottery. The clawfoot tub, which reached the apex of its popularity in the late 19th century; had its origins in the mid 18th century, where the ball and claw design originated in Holland, possibly artistically inspired by the Chinese motif of a dragon holding a precious stone. The design spread to England where it found much popularity among the aristocracy, just as bathing was becoming increasingly fashionable. Early bathtubs in England tended to be made of cast iron, or even tin and copper with a face of paint applied that tended to peel with time. The Scottish-born inventor David Buick invented a process for bonding porcelain enamel to cast iron in the 1880s while working for the Alexander Manufacturing Company in Detroit. The company, as well as others including Kohler Company and J. L. Mott Iron Works, began successfully marketing porcelain enameled cast-iron bathtubs, a process that remains broadly the same to this day. Far from the ornate feet and luxury most associated with clawfoot tubs, an early Kohler example was advertised as a "horse trough/hog scalder, when furnished with four legs will serve as a bathtub." The item's use as hog scalder was considered a more important marketing point than its ability to function as a bathtub. 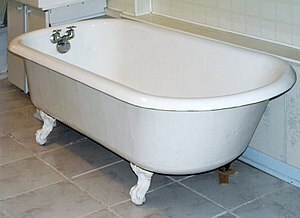 In the latter half of the 20th century, the once popular clawfoot tub morphed into a built-in tub with a small apron front. This enclosed style afforded easier maintenance and, with the emergence of colored sanitary ware, more design options for the homeowner. The Crane Company introduced colored bathroom fixtures to the US market in 1928, and slowly this influx of design options and easier cleaning and care led to the near demise of clawfoot-style tubs. The clawfoot tub or claw-foot tub was considered a luxury item in the late 19th century, originally made from cast iron and lined with porcelain. Modern technology has contributed to a drop in the price of clawfoot tubs, which may now be made of fiberglass, acrylic or other modern materials. Clawfoot tubs usually require more water than a standard bathtub, because generally they are larger. While true antique clawfoot tubs are still considered collectible items, new reproduction clawfoot tubs are chosen by remodellers and new home builders and much like the Western-style bathtubs, clawfoot tubs can also include a variety of shower head options. Classic roll rim tubs, also called roll top tubs or flat rim tubs as seen in the picture at the top of this page. Slipper tubs – where one end is raised and sloped creating a more comfortable lounging position. Double slipper tubs – where both ends are raised and sloped. Double ended tubs – where both ends of the tub are rounded, as opposed to the classic roll tim tub, which has one rounded end and one fairly flat end. Pedestal tubs rests on a pedestal in what most would term an art deco style. Evidence of pedestal tubs dates back to the Isle of Crete in 1000 BC. A baby bathtub is one used for bathing infants, especially those not yet old enough to sit up on their own. These can be either a small, stand-alone bath that is filled with water from another source, or a device for supporting the baby that is placed in a standard bathtub. Many are designed to allow the baby to recline while keeping its head out of the water. Hot tubs are common heated pools used for relaxation and sometimes for therapy. The "hippie" era (1967–1980) popularized them in America in songs and movies. Whirlpool tubs first became popular in America during the 1960s and 70s. A spa or hot tub is also called a "jacuzzi" since the word became a generic after plumbing component manufacturer Jacuzzi introduced the "Spa Whirlpool" in 1968. Air bubbles may be introduced into the nozzles via an air-bleed venturi pump. Freestanding tubs have become popular in recent years as a result of larger bathrooms being constructed. Freestanding bathtubs are made from a variety of  materials including stone resin, cast stone, acrylic, cast iron, fiberglass, and porcelain. Soft tubs are made from soft plastic or foam with a protective non-slip coating. While soft tubs have been available since the 1970s, by the 1990s they were being sold by major manufacturers. The tubs are typically marketed to children and the elderly to prevent injury from falls. Wikimedia Commons has media related to Bathtubs. Look up bath, tub, or bathtub in Wiktionary, the free dictionary. ^ "The Evolution of the Design Bathtub in the History". CeramicaFlaminia. 13 August 2015. Retrieved 21 August 2016. ^ McCleary, John Bassett (2002). The Hippie Dictionary. Canada: Ten Speed Press. p. 220. ISBN 978 1 58008 547 2. ^ "Freestanding Bathtub Material Comparison". ^ a b Austin, Gene (July 19, 1991). "Soft bathtubs touted as the new wave in offbeat bathroom fixtures". The Baltimore Sun. Retrieved 27 July 2018. ^ Reif, Rita (September 2, 1976). "Doesn't Anyone Out There Need a Soft Bathtub?". The New York Times. Retrieved 27 July 2018. ^ Austin, Gene (August 17, 1991). "Will The New Soft Bathtub Need A Hard Sell?". Chicago Tribune. Retrieved 27 July 2018.